Autonauts community · Replied to maxlevelbeast in how do u use the cheats? There is no real reason to use the cheats that exist for Autonauts in the current version, since all they will do is allow you to set the capacity of each item's storage bin to a very large number and the current number of items in their bins. In other words, you don't need to cut down logs and turn them into planks and poles and other items, etc. But all that really means is that you skip doing all of the interesting tasks of the game. If you just want to say "I beat the game", go ahead and tell yourself that, even if you haven't really done so. I recommend instead that you enjoy playing the game just as the rest of us have. Here is one example of how you can use the Hear commands. In my fishing group as shown below, I have one bot wearing a Party Hat which is named "GoFish". This bot monitors the Salmon Storage with the command "Repeat until Salmon Storage not full". Once that condition is true, it will use the command "Shout GoFish" and will then wait 60 seconds before repeating everything. I have another bot wearing a Guy Fawkes Hat which is named "StopFish". This bot monitors the Salmon Storage with the command "Repeat until Salmon Storage full". Once that condition is true, it will use the command "Shout StopFish" and will then wait 60 seconds before repeating everything. I also have 7 bots with names such as "Fish1". These bots will wait based on the command "Repeat until hear GoFish". Once that is shouted by the first bot, these 7 bots will then run the commands in the "Repeat until hear StopFish" loop, which are "Find nearest Deep Sea Water" and "Use held item" (which is the fishing rod). Thus, the 7 bots will fish for salmon until the Salmon Storage is full. I also have 3 bots with names such as "Fish>Stor1" which simply move the salmon that have been caught into the Salmon Storage bin, and two bots wearing Traffic Cone hats which wind all of the other bots whenever needed. Since Denki recently reported that they have found a publisher for the new version of Autonauts, there certainly won't be any more updates to the old version of Autonauts. I presume that your statement "it is about the metal not coming out most of the time" refers to how when a bot uses a pickaxe on the grey areas called "metal deposits" sometimes stones are harvested and other times metal ores are harvested. You would like the frequencies of those harvests to be 75% metal ore and 25% to be stone. Since it has been several months since your first posting on this topic, I imagine that you have already created several bots that store the stones and the metal ores into storage bins and have created other bots that use those stones and metal ores. Once the stones and ores are being stored and used, it no longer should matter how frequently they are harvested. Since the winding of the bots is also not an issue, perhaps you might find helpful an example of how one bot has been trained to only use the Pickaxe on the Metal Deposits when needed and to get a new Pickaxe when its hands are not full because the last Pickaxe broke, as shown below. Rather than training your bots to work on rocks or boulders to recover stores and iron, you should train them to take a pickaxe to work on the grey areas called "metal deposits". They will then dig up both stones and metal ore. The metal ore can be combined with charcoal in a clay furnace to make metal, which then can be used for making metal plates, metal poles, metal gears, and then making steambots. Thank you for this information. This will be very helpful. Are the "Folk Seeds" things that the Farmer/Player can find on the map, or do we need to create a special building (or "bedroom" ;)), or is there some other method for creating them? If there needs to be a building or bedroom, how many Folks need to enter it? Unless there is an "Adam" and an "Eve" at the start of the game or maybe only two Folk Seeds that could be found, I guess that there probably won't be a building or a bedroom. Once I have purchased the new Autonauts, I expect that I will have lots of questions for you about the new variable names and their values. Thank you. Congratulations to you for your contract with the publicist. I look forward to seeing the release of the new version of Autonauts. I have a few questions for you. What will you call this version? I see from your screenshots and your video that all of the Storage Bins have question marks on them. Will those Bins get symbols that show what they contain like the current version has? I don't see any Folks or Natives. Will Folks exist in the new version? I don't see any names on the bots. Will we still be able to make Name Badges and give names to the bots? In the current version, the Save file was a .txt file which allowed us to edit it using MS Notepad. I found that editing the Save file provided a lot of interesting capabilities, such as naming the Folk, adding additional cows, and changing the type of land on the grid. Will the Save file remain as a .txt file? If not, what will its file extension be? Will we still be able to edit the Save file? Autonauts community · Posted in Renaming the workers? In order to rename any bot, you need to build for it a Name Badge on the Basic Workbench using one Plank. While having the Name Badge in the Farmer-Player's hands or inventory, you then select that bot, click on the "Trade" option, and put the Name Badge into the bot's "Upgrades" area. Once the bot has a Name Badge, you can click on its Name (such as "CB005") and then type a name for it of up to 10 characters (such as "RECHARGE01"). Several people in the past have agreed that adding Conditionals to the scripting language would certainly help. The developers have been working for over a year on the next version of Autonauts. They have said recently "Unfortunately, if we release it too early, we'll just get loads of complaints about things that don't work or can't understand. We're going to release when we think it will be ready and make everyone happy rather than angry/confused." While we are waiting, you can use the "Repeat until hear..." commands in the scripting language to act as Conditionals and you can use Steam Bots to overcome the problem of Worker Bots needing to wait a long time for recharging. Below is shown one example of how to build bots that use the "Repeat until hear..." commands. One bot named "GoFish" (wearing a Party Hat) will wait until the Salmon Storage is not full and then will Shout "GoFish". Another bot named "StopFish" (wearing a Guy Fawkes Hat) will wait until the Salmon Storage is full and then will Shout "StopFish". A set of 7 bots with names like "Fish1" will wit until they hear "GoFish" and then will repeat until they hear "StopFish" the commands to "Find nearest Deep Sea Water" and "Use held item" (which is the Fishing Rod). These commands will control the bots so that they only catch fish when needed. 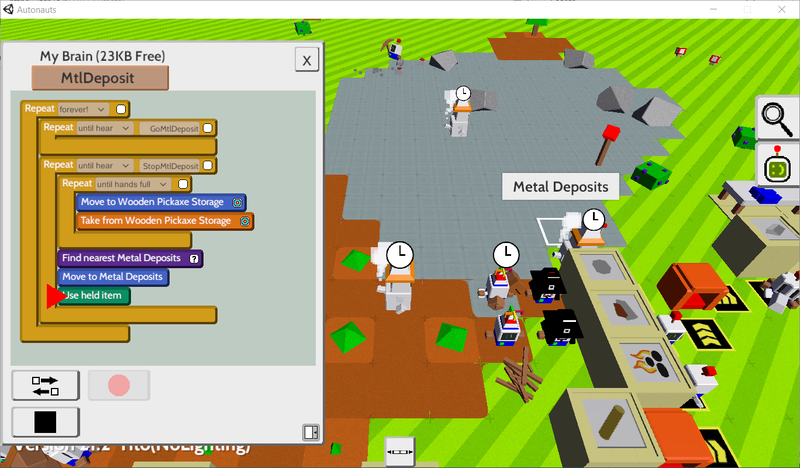 Below is shown an example of how you can set up a Steam Bot (wearing a Traffic Cone Hat) to charge Worker Bots and to also collect Logs into its inventory to keep itself charged. After the Steam Bot has taken a Log from the Log Storage, if its inventory is full then the "Stow held item" command will fail and the Log will still be in its hands, and so it will add that Log back to the Log Storage. If its inventory was not full, the "Stow" command will run and the "Add to Log Storage" command will be skipped because its hands are empty. You can set the number of times that the "Repeat times …" command runs based on how much energy is used by the Steam Bot to find and move to recharge the Worker Bots. Autonauts community · Replied to georeb in why hasnt this game uodated yet? According to Denki "We've pretty much completed all the objects we plan on releasing in the next version and right now we're spending a lot of time improving balance and structure. But we've still got a long way to go :)", as posted in https://itch.io/t/368237/objects-in-the-next-version-of-autonauts. I'm sorry to hear that there won't be "an equivalent of the Steam Bot in the next version". I recall spending a lot of time creating multiple Basic Bots in the current version that could wind other bots and each other. I found sometimes that if I only had two Basic Bots winding other bots in an area that was not being watched, that after I came back to look at that area after several minutes, all of the bots had run down already, including the two who should have been winding them and each other. Having the Steam Bots overcame that issue. Hopefully, when you create the Mk3 in the subsequent version, it will not need to be wound and will appear in an early subsequent version. Thank you. To recharge a SteamBot, you need to provide it with fuel, such as logs, wooden planks, wooden poles, or sticks. I have set up my SteamBots to be responsible for recharging the WorkerBots and to also fill their own inventory with logs so that they recharge themselves. 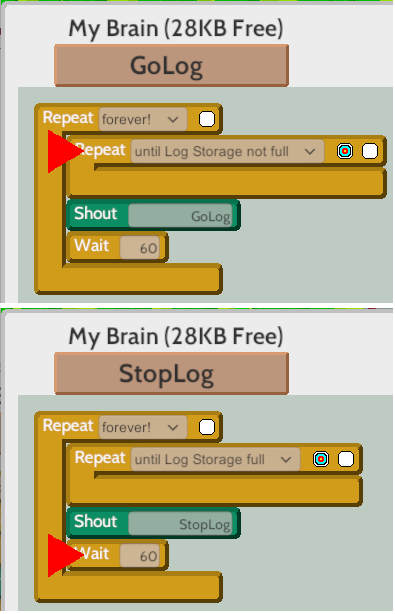 Below is an example of how a SteamBot will take a log from a Log Storage bin, stow that log into its inventory, and if the inventory is full its hands will still hold that log and so it will add the log back to the Log Storage bin, and then it will recharge 25 WorkerBots. Thank you for that information. Regarding your statement "When the next version comes out we'll only be going up to, but not including, the Steam Age...", in the current version, the only object that I think could be included in the "Steam Age" is the Steam Bot. I recall that in other postings you have said that for the next version, instead of Basic Bots and Steam Bots there are only combinations of the 3 bot parts: Head, Body, and Drive, each of which could be different "Mk" versions. I liked the Steam Bots in the current version because they did not need to be "wound" and they could collect the fuel that they need to run (such as logs) by themselves rather than depending on others. In my game, I set up Steam Bots to do all of the winding of the Basic Bots. In the next version, will Bots still need to be wound by others or can they somehow get their own fuel similar to how the Steam Bots did? Hi Aaron and Gary. This week, I have been admiring and studying "that mahoosive technology tree timeline flowchart" for the next version of Autonauts that you posted about early in 2018. I think that each item listed in that tree (other than some of the category levels) probably corresponds to game objects that bots can interact with in the game and which you two have been working to develop for it. I have counted those items and the number I found was about 500 objects. Does that number seem close to the number of objects you are developing? Without spending a lot of time finding out, could you estimate the percentage of those objects that you feel have their programming completed so far? I know that along with doing the programming for the next version that you are also working to find a publisher for the game. I can understand how that is a different challenge from developing this amazing game. Working well with code and working well with other companies' legal and bargaining teams are distinct skills, but I have confidence that you will succeed. Thank you for all you have done. Good Luck. One thing that we certainly don't need to do is to give the developers more suggestions for additions to the game. They have been working on adding so many suggestions from everyone that it has been over 14 months since we have gotten an update. We all need to realize that when Denki said "Remember that mahoosive technology tree timeline flowchart we did? ", that meant that the developers were planning on building that entire timeline into the next version of Autonauts and that they are going to need a mahoosive amount of time to do so. Adding more and more suggestions will keep delaying the release of the next version. Let's be happy with what they plan to provide us. When you start Autonauts for the very first time, you can pick up a stick from the ground and pick up a stone from the ground. You will be given the options to make a crude axe or make a crude shovel. Choose to make one of those. Then, pick up a second stick and a second stone and make the other crude tool. You can use the crude axe to chop down pine trees, which will give you a log and some tree seeds. Use the crude shovel to dig holes in the ground and plant the tree seeds. Use the crude axe to chop the log into some planks and use the crude axe to chop the planks into poles. Repeat this a few times to get several more logs, planks, and poles. Press the E key to view the list of Equipment (buildings, etc.) that you can build. You should eventually make most or all of the buildings. Some of the buildings can be used to build bots. 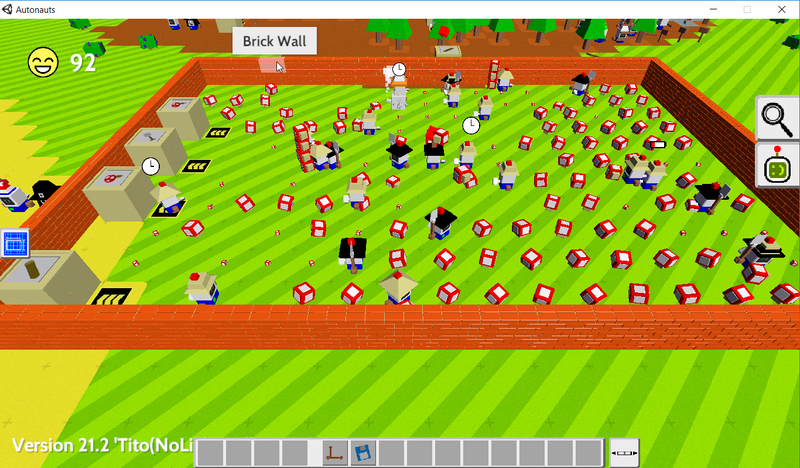 One you have built some bots, you can train them to do all of the tasks of the game. Have fun. You can harvest sticks from pine trees. I have found that since you need sticks for so many recipes (bread, fish, soup, pies, etc. ), you should create many bots to harvest the sticks, perhaps 10 or more bots. In order to harvest the sticks from the pine trees, built wooden mallets for each bot on the Basic Workbench. I have trained my bots to use the mallets on a circle of pine trees. Each bot hits its mallet on the first tree, then the second tree, then the next tree, etc. until it has walked in the circle back to the first tree and the sticks have fallen from all of the trees. Another set of bots collects the sticks from the ground until their hands are full and drops them into the stick storage bin until their hands are empty. Well, the image that you added is the same as the one you put here a week ago, so that doesn't give any more information. I was hoping that the image you were going to add would show what was below the commands "Repeat until hear work" and "Move to 162,104". Maybe what is below is just the end of the loop for the "Repeat until hear work" command. 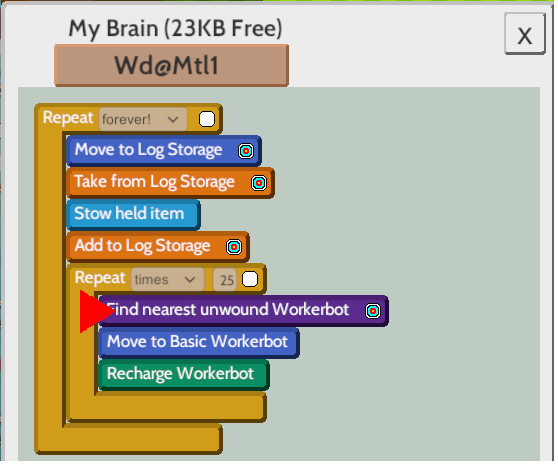 If so, that would mean that this bot will just move to that spot once and then stay there forever waiting until it hears "work" which doesn't happen until you change the other bot to shout "work", which is what I think you meant when you said you had to either "START & STOP" or "change the order of the repeat" to fix it. 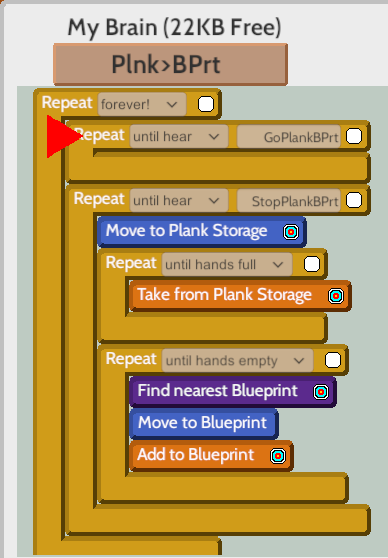 If you still are having this problem, I suggest that you try my first suggestion and have two bots shouting "Stop" and "Go" individually and then have the bot that adds the planks to the nearest blueprint do so as shown below. We might be able to help you better if you provide an image of the end portion of this bot's commands, which might be responsible for your problem. Please also provide an image of the other bot's commands that shouts "work" and "don't work". I found that it works better if I have two separate bots that shout, one that shouts "Stop" and a different one that shouts "Go". Each of the shouting bots also waits for 60 seconds before it checks if it needs to shout again so that it doesn't loop too quickly and isn't shouting too often. If a bot shouts too often, the specific shout that others are waiting for gets pushed to far down in a stack that it could get lost or never found in that stack. Below is one example of how I have set up the "if ? storage is full" statement (as I have suggested before). I have several Bots set up such as those shown below for my "Fishing" group. I have one Bot named "GoFish" (wearing a Party Hat) that waits "until Salmon Storage not full" and then will "Shout GoFish". I have one Bot named "StopFish" (wearing a Guy Fawkes Hat) that waits "until Salmon Storage full" and then will "Shout StopFish". I have seven Bots named such as "Fish1" that wait "until hear GoFish" and then will "Repeat until hear StopFish" the two steps "Find nearest Deep Sea Water" and "Use held item" (which is the fishing rod). I have three Bots named such as "Fish>Stor1" that move the Salmon to the Salmon Storage. I have two Bots (wearing Traffic Cone Hats) that rewind the other Bots. You can put bots into the Recycler to get back the parts used to build them, or you can put bots into the Incinerator to just get rid of them, but why would you want to replace them with new bots? You could just retrain the old bots to do what you would otherwise make the new bots do. You could even use the Crude Data Storage to retrain an old bot to do the same tasks as another bot if you want. We all need to realize that when Denki said "Remember that mahoosive technology tree timeline flowchart we did? ", that meant that the developers were planning on building that entire timeline into the next version of Autonauts and that they are going to need a mahoosive amount of time to do so. (https://www.easyzoom.com/imageaccess/e695d99b885246ac8c048550694bac93). Now that it is November 2018, I no longer expect them to be able to complete the development of the next version during this year, as they suggested back in November 2017. I will not be surprised if we are still waiting in November 2019. Just for your information, the game automatically creates save files for you each time you see a piggy bank shown in the bottom-right corner. Those save files are kept in a folder with a name like C:\Users\Owner\Documents\yourname\Autonauts\Autosaves, as shown below. Of course, everything does not need to be absolutely perfect before it is released. We all enjoyed getting the updates last year that gave us something better each week. We don't want to wait for perfection but instead have something that we can enjoy at the new year. You said "I just updated...". Does that mean you downloaded a newer version of Autonauts, or does that mean you just loaded a recent save file, or does that mean something else? If you just loaded a recent save file, perhaps that save file is broken somehow. I suggest that you try loading an earlier save file that you had loaded before and which you were able to use without this problem. If you mean something else, please clarify what happened. I also suggest that you take a screenshot of your game while you are pointing at the ‘unusable tree soil’. You can take a screenshot by pressing the "PrtScr" key - you might need to also hold down another key such as "Shift" or "Ctrl" or "Alt" or "Fn". You can then open Microsoft Paint and paste your screenshot there, and then save the file in Paint with extension .png. You can then come back here, enter your reply, and click on the "Add Image" icon just above your reply which will allow you to upload the .png file. Once you have given us some more information, we may be able to help you more. That sounds like a good idea. After I read the post from Denki that said "Remember that mahoosive technology tree timeline flowchart we did? All of those components have at last been organised, ready to be contained in game in the coming months...", I started to think that it might take many "coming months" (or possibly another year or more) before the next version is released. I hope that I will still be visiting this site at that time. If something is released that contains some of the test versions, that would help keep up interest in Autonauts while we are waiting. I am excited by all of the progress that you both have made on the next version of Autonauts! All of your fans will be thrilled once you have released the first of what I hope will be several incremental releases. Have you given a name to this next version yet? Will it be something like Autonauts II or Autonauts 100.0? When I first started playing Autonauts over a year ago, I started making the Buildings including Storage Bins, Bench Saws, and Workbenches. At first, I thought that I might be able to connect the output from one Bench Saw to the input to a second Bench Saw. The first saw would cut a log into planks and the second saw would cut the planks from the first saw into poles. I soon discovered that this was not possible. I would like to suggest that for a future incremental release that you consider “Automating one Building’s output into another Building’s input”. I can imagine that it could be done by allowing the tile that indicates one building’s output could occupy the same location on the grid as the tile that indicates the second building’s input. 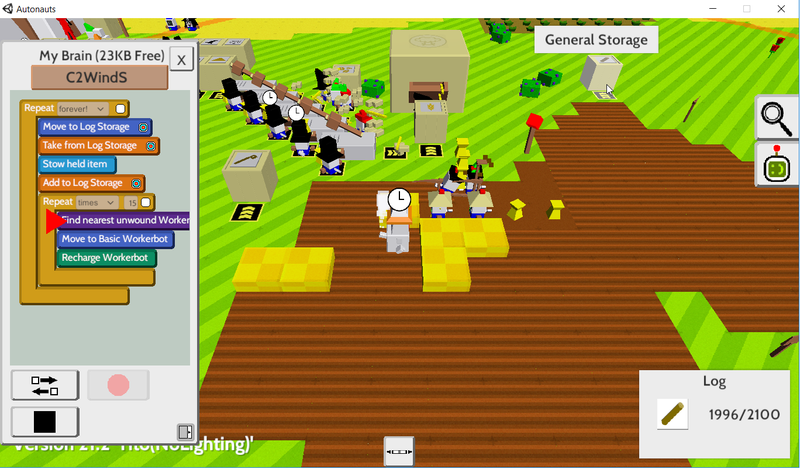 Connect the output from Bench Saws or Workbenches or other Buildings to the input to Storage Bins for the same items. Connect the output from one Kitchen Table that makes Pastries to the input to a second Kitchen Table that makes Raw Apple Pies. A bot would then add Apples to the second Kitchen Table to produce its output. Connect the Raw Apple Pie output from the second Kitchen Table to the input to a Crude Oven. A bot would then add Sticks to the Crude Oven to produce its output of Apple Pies. Connect the output from Buildings to the input of the new Railroad Cars so that items could be auto-transported. Connect the output from the new Railroad Cars to the input to Workbenches or other Buildings. Connect the outputs from multiple Buildings to the inputs to another Building. I recall that you had posted a few months ago an image that showed that you had combined the input and output tiles of some buildings into a single tile, and so my suggestion might be a bit complex, but I have every confidence that you are capable of building the logic to do this. 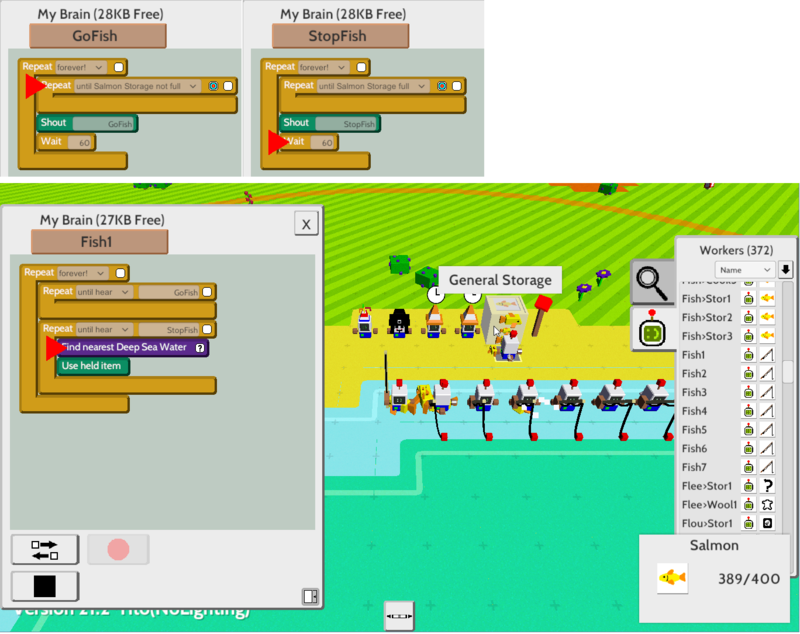 Since the Crude Oven is used for making so many different foods, I have found that I needed lots of bots using Mallets on Pine Trees to knock down lots of Sticks and I needed lots of bots to put those Sticks into the Bins, as shown below. 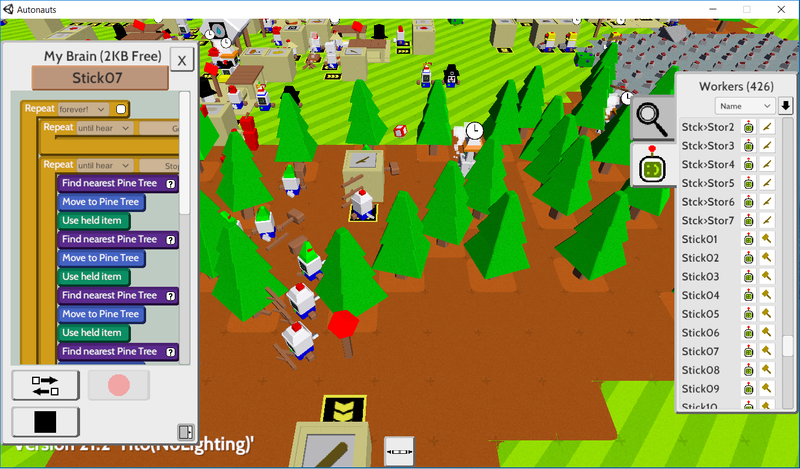 I trained 10 bots to walk in circles to a group of trees to quickly knock down lots of Sticks. To collect sticks, either the Farmer Player or trained bots can use a Mallet to hit Pine Trees which will make sticks fall to the ground. Sticks on the ground can be collected and stored in bins and then used for building the Cauldron, the Besom Broom, the Crude Torch, and the Crude Basket. Sticks can also be used as the fuel for Steam Bots and for the Crude Oven. Thank you for that information. I can understand why you dropped the idea of automatically growing mushrooms on tree stumps. When I first started planting dug mushrooms in the current (and past) versions of Autonauts, I saw that planted mushrooms would spread to every available nearby empty space. I built my mushroom farm within an area completely enclosed by a brick wall, with enough bots inside the wall to dig up the mushrooms, store some of them, plant some of them, and one Steam bot to wind up the others. That way, the mushrooms would only grow in that area. I see on all of the images shown here what looks to me to be tree stumps on the ground where trees could grow and be cut down. Are those stumps? Will we need to dig them up or will they always remain there? If we can dig up tree stumps, can they be used for anything? If they are not stumps, what are they? I don't use the Linux version but I would not be surprized if your game takes forever to load from your save.txt file (or whatever it is called in the Linux version.) If so, I suggest that you review this post and take whatever action is similar for Linux so that your game will keep running. Your request to Denki looks like you are seeing bots' energy running out and you are having the Farmer-Player wind those bots "all day long". Since the developers have been working for almost a year now on creating the next version of Autonauts, there won't be any more updates from them to the current version. Hopefully by now you have built some bots that can wind other bots. You might have then found that the bot-winding-bot also has its energy running out and so it also needs another bot to wind it. Some people like to build Steam Bots and give them the task of winding the Basic Bots because the Steam Bots don't need to be wound and can instead put logs into their own inventories to keep their energy from running out all by themselves. At the start of the game, the Farmer-Player can pick up from the ground a stick and a stone and combine them into an axe. The axe can be used to cut down trees into logs and then can be used to cut logs into planks and can be used to cut planks into poles. Those logs, planks, and poles can then be used to make other buildings and tools. The simple solution is to build additional storage bins near where you collect objects (such as logs) and then add one object (one log) to that bin. By having your bin near where its object is collected, your bot won't have to walk so far to use it. You might want to read this posting that tells what you will want to do once you find that Autonauts starts to slow down a lot when you load your save file. When you have super-tall piles of logs and planks and all of the other things, you will have a problem, which this posting will help. Autonauts community · Posted in Autobuilders? Here is another example. This Bot will fill its Inventory with Planks and then add those Planks to the nearest Blueprint to the Beacon. Here is an example of how this can be done. This Bot will add Stones to the Blueprint that needs Stones that is the nearest to the Beacon that is set by the blue and red icon. The Farmer-Player can then move that Beacon to wherever you want and the Bot will then walk towards that Beacon, find the nearest Blueprint, and add the Stones to it. To grow 15 Tree Seeds in the Seedling Tray, you will need to also add 5 Fertilizers, which are made by adding Dung to the Compost Bin. If you are asking how to use the "Bash Research Station", below are the instructions that I posted about a month ago about it. First, you need to build the "Bash Research Station" from the "Research" group of equipment. The "Bash Research Station" is made with two logs and four planks. Once it has been built, you need to use a shovel to dig up about 10 weeds. Add the dug weeds to the "Bash Research Station" until the research has finished and the blueprint for the "String Maker" appears in the "Misc" group of equipment. The "String Maker" is made with six planks, four poles, one gear, and one stone. Once the "String Maker" has been built, you then add five dug weeds to it to make string.